The projects you create are private and secure by default. The only people who have access are those you invite to the project. Within your account, projects can be set to Public or Private. Setting a Project to Public means any Team Member on your Team will have access to this project. Projects set as Private are only seen by the Team Members that have been invited to the project by the creator of the project. Project Sharing allows Collaborators to join the project with a URL without an exclusive invite. This is useful when you need to invite multiple users to a project. This is also useful to send through a shared chat, such as a Slack Channel. Once everyone joins the project, disabling Project Sharing ensures your project remains private. 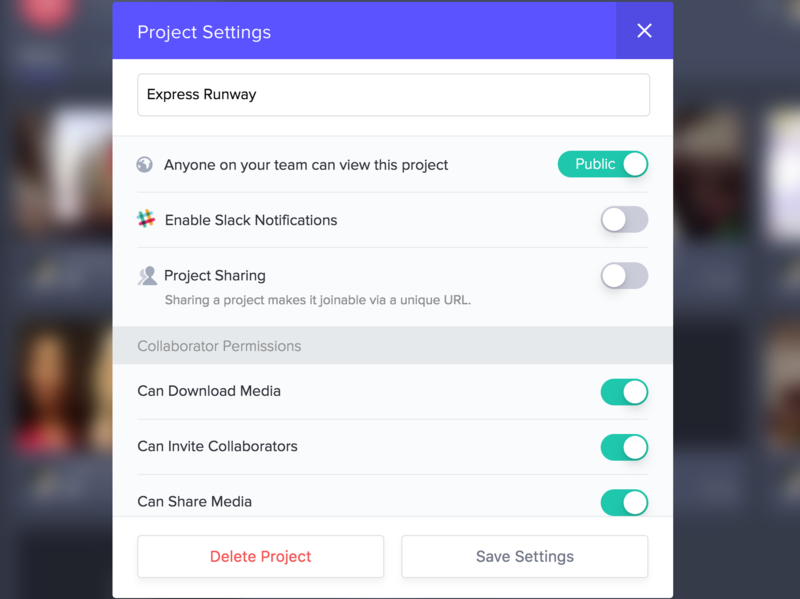 Collaborators already have limited permissions in your project, however, downloading can be enabled or disabled under each Project's Settings. Collaborators on accounts created prior to August 14th, 2018, can share presentations and add other Collaborators to projects. These permissions can be disabled on a per project basis. We have removed these collaborator permissions for accounts created after this date. My Email Notifications relates to the email notifications you want to receive. Enabling "New Comment" means any comments made by other users on the Project, will trigger a New Comment email notification. Enabling "New Media Uploads" means an email notification will be sent every time a new upload is made to this project by another user. Enabling "New Person Joins" means you will be notified when a New Person has been added to the project by other users. Everyone Else's Email Notifications sets the default notification setting for the collaborators. However, users can adjust their own notifications. You can access your Project Settings anytime to make changes.